Welcome back Team Stryker fans! 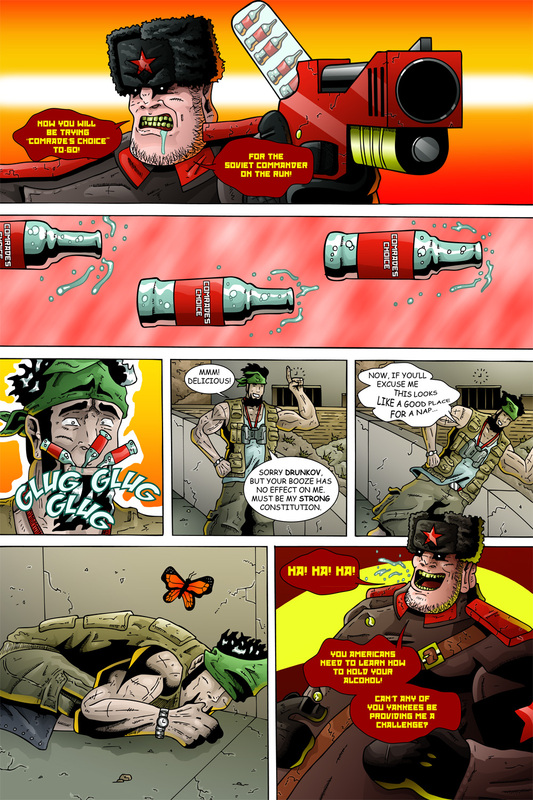 Part 2 of V-Scope vs Boris Drunkov was planned from the very beginning as I had designed Drunkov to have two guns: his primary gun attached to his giant bottle of vodka and his backup gun that fires mini bottles. For a year and a half I was managing a liquor store and I couldn’t figure out who the tiny plane-sized bottles of vodka were for. I can understand them for plane rides since you (usually) only need one drink, but other than that they seemed weird to me. My only thought it that they would make great projectiles since they almost resemble bullets. One of the things I wanted to do with this issue is have Team Stryker all pass out in different ways to highlight their personality. Casanova goes from party animal to passed out in a matter of seconds, Eagleheart talks American propaganda and V-Scope simply freezes in place. The way V-Scope passes out is the way I used to sleep as a child. There is something very innocent about sleeping all curled up with a thumb in the mouth. To find out if Deadeye fares any better against the unstoppable Boris Drunkov you’ll just have to check back next Monday! Until then, check back on Wednesday and Friday for all your Team Stryker updates!